It’s crazy to believe that this semester is already almost over, only 16 days left, not including finals. It’s even crazier to think that this is my last fall semester at UofL. I have the days counted down for graduation in May already too, 168 days in case you’re wondering. This semester has flown by, they say the older you get the faster time fly’s, but I didn’t think it would start this soon. Big things are beginning to happen but at the same time my time at UofL is quickly coming to an end. This semester has been one of the toughest semesters during my time at UofL, for more than a few reasons but taking 18 hours may have had the most to do with it. But yet, as of now I have all A’s & B’s, not to toot my own horn, but if it’s one thing this semester has taught me it’s that hard work, though it may not seem like it at the time, does finally pay off. Not only did we learn about social networking sites, we learned what social media can do for us, as individuals, and how we can use it to our own advantage and to even promote ourselves. Let’s take Klout for example, I had never heard of Klout, but now I’m constantly checking my score to see if it has gone up. 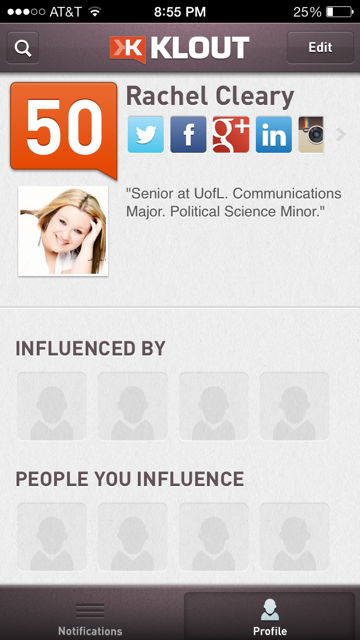 Klout is a site that measures your influence based on activity through your social media sites. I am up to a 50, if I don’t mind saying myself, before this class I was not even a 20, so it’s not a far stretch that this class has helped to dramatically improve my influence. My favorite part of the class is a tie between how active we had to be on Twitter and having to blog every week. 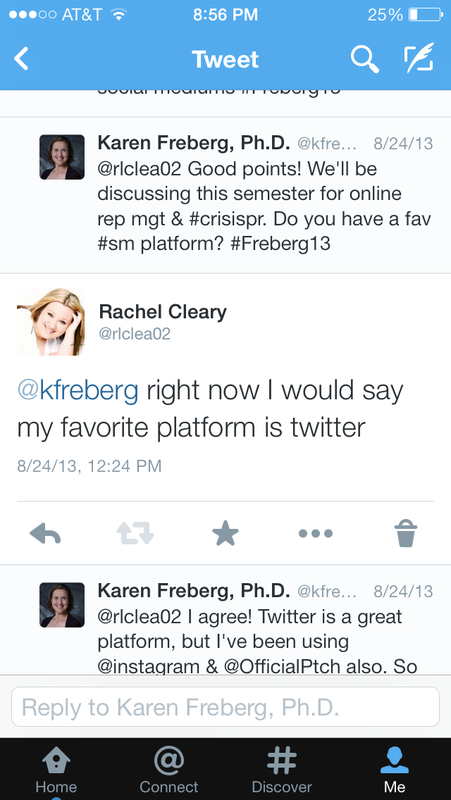 I love Twitter, it’s easily my favorite social networking site, and I told Dr. Freberg that from the very start of the class. Also, I love writing, so having to blog as an assignment two or three times a week, was not really like an assignment for me. It’s crazy to think that I did not have a blog before this class, especially since I want to be a writer. Dr. Freberg and several guest lectures taught us how to share our blogs. The coolest part, to me anyway, about my blog is that I can see how many views I have and where exactly they are coming from, before this class it probably would have taken me a good while to figure out how to do that. 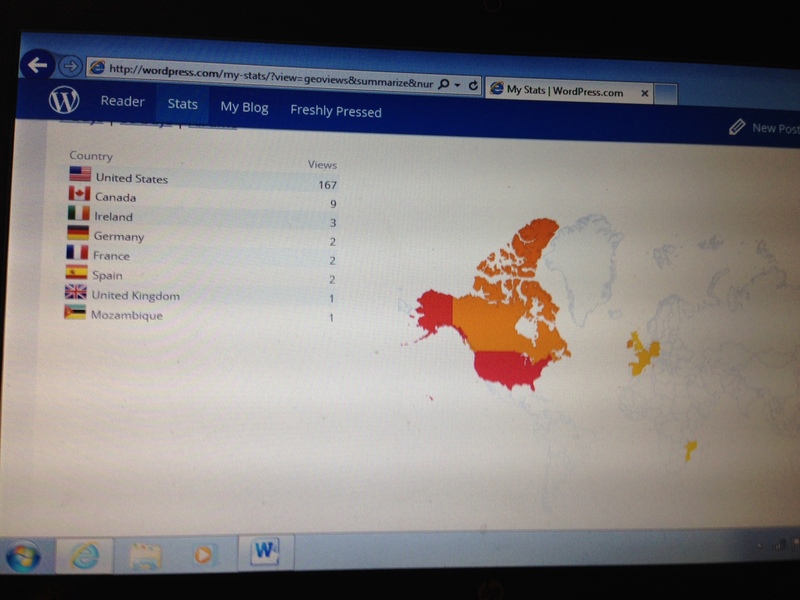 Currently, I’m up to 188 views, in 8 different countries, which just blows my mind. Oh hey, I should mention there aren’t any exams in this class, but don’t think that means you’re getting off easy. This class requires a lot of work and commitment, especially in the group assignment. Our group assignment was nothing like I have ever done before. We were assigned a client and to essentially come up with a new social media campaign plan for them, I’ll share more about it once we are completely done, as of now though I think we have a pretty good plan. So basically, this is easily one of the best classes I have ever taken, and I’m almost sad that it is going to end; partly because I can’t take anymore Communication classes and partly because I know any other class I have left to take won’t be able to live up to this one. It’s been great, enough said.